When it was initially planned, Batman Beyond: Return Of The Joker was going to be the dark, gritty Batman animated movie that pushed the boundaries of the DCAU thanks to its direct-to-video release. Then the Columbine school shooting happened. Suddenly, children’s media was being put under a microscope and stripped of any excessive violence or potentially disturbing content in an effort to prevent a generation from trying to kill their classmates. (A similar development occurred after the Aurora shooting, with Warner Bros. choosing to make new edits to their upcoming Beware The Batman cartoon.) 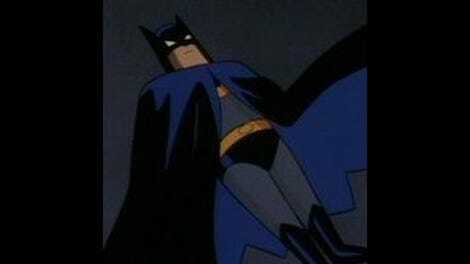 When Return Of The Joker saw release, a considerable amount of the violence had been cut, and dialogue referring to death and killing had been changed. The integral scene depicting the Joker’s death was completely revamped, shifting from a killing that was blunt and brutal to one that makes the hero less responsible for the villain’s end. Even with the edits, Return Of The Joker is still one of the most disturbing DCAU stories, but the uncut version is even stronger, revealing just how bleak and vicious Gotham City has become over time. Combining the visual style of Batman: The Animated Series with futuristic sci-fi elements that fall somewhere between the work of Jack Kirby and Akira creator Katsuhiro Otomo, Batman Beyond created a striking new vision for the titular hero and his city when it debuted in 1999. With a new lead in Terry McGuinness, the writers blended the teen drama of Spider-Man with the vengeful drive of The Dark Knight, creating a replacement for Bruce Wayne that was ultimately embraced by fans that were hesitant when he debuted. Fox debuted a future version of Spider-Man the same year as Batman Beyond, but Spider-Man Unlimited lost track of the core concepts behind the hero in favor of a story about Peter Parker fighting mutated animals on an alternate Earth. Batman Beyond had a new setting and characters, but the fundamental idea of Batman—the need to avenge a loved one’s death by making sure the same thing doesn’t happen to anyone else—is at the series’ foundation. TMS is the animation studio that worked on Akira, and there are multiple nods to the anime masterpiece in this film, from the opening Jokerz battle to the vehicle design and giant laser beam that threatens to obliterate Gotham City. That’s a very good influence to have, and Return Of The Joker is an absolutely gorgeous film, depicting future Gotham City with a level of detail and smoothness that isn’t possible on a television budget. The opening action sequence between Batman and the Jokerz captures the incredible impact of their battle, with director Curt Geda and his storyboard team earning their PG-13 by ramping up the intensity of the violence and the intricacy of the fight choreography. All the technical elements are on point, from the typically outstanding voice work to the music (which has the orchestra that Mystery Of The Batwoman was sorely lacking), and for the first time since Mask Of The Phantasm, the script is just as strong. The reason Bruce Wayne pushed himself away from his sidekicks and eventually gave up the cowl is one of the great mysteries of Batman Beyond, but all is revealed in Return Of The Joker. This movie is essentially The Killing Joke mixed with “Death In The Family,” showing Batman’s archenemy going after one of the hero’s partners to cause profound damage to the entire Bat-family. When the Joker returns to Gotham City after his apparent death years earlier, Terry pulls back the curtain to discover the darkest part of his mentor’s past in order to stop a villain that knows all of Batman’s secrets. Commissioner Barbara Gordon tells Terry about the original Joker’s last great scheme to destroy the Bat: He kidnapped Tim Drake and tortured him for three weeks until he told Joker everything he knew about the Caped Crusader. When Batman and Batgirl found the former Robin, he had been psychologically scarred to the point that he had become the clown’s cackling protégé, the offspring that Papa J and Mama Harley always wanted. Paul Dini is one of the strongest writers in the DCAU, and he shows an outstanding understanding of the relationship between Batman and the Joker in this movie. 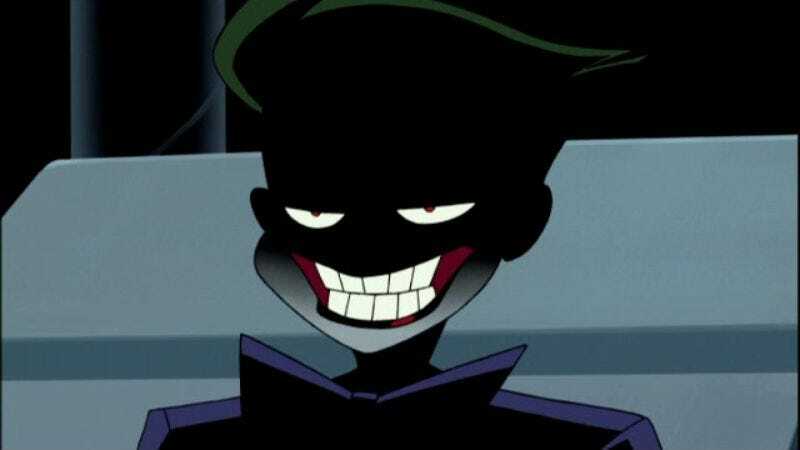 He also depicts a Joker that is more ruthless and demented than he’d ever been on BTAS or TNBA, and his Robin torture plot would never have made it past Broadcast Standard and Practices. But abducting the sidekick and shattering his mind is just the first step of Joker’s plan, a plan that includes the death of his old body. After Batman and Joker have their big brawl, Joker hands Tim a gun and asks him to shoot his former partner, but the boy kills the clown instead. (In the edited version, Tim pushes Joker and breaks a container of water, drenching the clown and causing him to slip and hit an electrical switch. The clown gets fried in a morbid twist on the slipping on a banana peel gag.) Death is Joker’s last big punchline, delivering the final blow to Tim’s psyche that pushes him away from Batman forever and begins the deterioration of Batman’s inner circle. Eventually, Bruce will be completely alone except for his dog. Joker’s return sheds light on Bruce and Terry’s relationship as Bruce begins to remember the ways he failed the last person to come under his wing. He tries to get Terry to abandon the Batman costume before the Joker makes him suffer like Tim, but Terry isn’t going to abandon the man who filled the void left by his father’s death. If anything, he’s going to work even harder to make sure Bruce doesn’t meet the same fate. Terry briefly considers giving up his secret identity until he realizes the Joker already knows the truth and won’t stop just because Terry does, and he arrives at the Batcave just in time to save Bruce from Joker’s poisoning. Now Terry just has to stop the clown from using a space laser to incinerate Wayne Manor and his girlfriend and mother’s houses. The relationship between Joker and Batman is at the center of this film, and the change in their dynamic from the past to the present reveals a lot about the men behind the Batman mask. When Joker discovers Batman is Bruce Wayne, he becomes even more obsessed with the hero as he considers the sad truth of his existence. “Behind all the sturm and Batarangs, you're just a little boy in a playsuit crying for mommy and daddy,” Joker tells him. “It'd be funny if it weren't so pathetic. Oh, what the heck? I'll laugh anyway.” Bruce is the little boy that put on a costume and was able to make a better world for himself, so to counter that, Joker uses Tim to show the dark side of putting on a costume to escape reality. In order to accomplish that, Joker encoded his DNA on a microchip he implanted on Tim, lying dormant in the boy’s psyche until he assumed enough power to take control of Tim’s body as an adult. I don’t know if it’s better or worse that this all happens against Tim’s will; while he’s not directly responsible for what Joker is doing, he’s also trapped in a body that is being controlled by one of the most insane minds on the planet. And this is years after he thought he had completely escaped that part of his life. It’s a truly tragic story, but thankfully Tim has Terry around to save him. From the ways he’s forced to juggle his personal life and costumed secret identity to his wise-cracking in battle, Terry McGuinness has always given me strong Peter Parker vibes. Like Peter, he understands the power of banter, using comedy to throw his opponents off guard and create a sense of bravado that makes him appear even more imposing and confident in battle. With his bright red costume detailing and rockets on his feet, the Batman of the future is much less subtle than his predecessor, and Terry’s more aggressive personality changes his dynamic with the Joker considerably. Terry knows which buttons to push to throw the clown off his game, and he starts to psychoanalyze the Joker to buy himself some time during the final battle. He talks about how desperately Joker wanted the original Batman to laugh, and the fact that he never got the desired reaction made him even more obsessed. Terry has no problem laughing at the joke he sees in front of him, cackling as he says, “So you fell in a tank of acid, got your skin bleached, and decided to become a supervillain. What, you couldn't get work as a rodeo clown?” This only infuriates Joker more as he yells that Terry isn’t the real Batman so his laughter doesn’t count, and his close-up rage gives Terry the opening to electrocute the microchip that contains the villain’s consciousness. There are punches thrown and throats choked, but Terry’s mouth is what really saves the day, essentially beating the Joker at his own game. After Tim’s life is saved, the healing of the former Bat-family begins. With the cowl now firmly in the hands of Terry McGuinness, Bruce, Tim, and Barbara can try to rebuild the relationship they used to have. The Joker initially caused Bruce to abandon those closest to him, but with the threat now completely gone, it’s time for him to open himself up to people who care about him. After applauding Terry’s work as Batman (but also telling him it’s not the thing that makes him worthwhile), Bruce is able to completely abandon his old mask and fully assume the life of Bruce Wayne. He finally gets a happy ending, even if the road to get there was paved with tragedy. Justice League Unlimited coverage begins next week, which means it’s time to dive into what I believe is the best superhero cartoon of all time. I hope you’ll all join me for the journey. Scott Snyder’s Batman had a fun little shout-out to Batman Beyond in last month’s #20, showing Bruce Wayne fighting Clayface with a prototype of Terry’s costume that still has years to go before being completed. I’ve written plenty about Mark Hamill’s voice work as the Joker, but he deserves recognition for pulling double duty in this movie to voice Joker red herring Jordan Pryce, an employee at Wayne Enterprises who isn’t happy with Bruce Wayne returning to the head of the company. There’s a gorgeous shot of Batman hitting the Joker into a projector that showcases how beautiful shadows and silhouettes look in the DCAU house style. I’m also a big fan of the bright red circuitry lining the interior of the flying Batmobile. “Aren't you the nasty tattle-tale? Ratting me out before I have my fun! 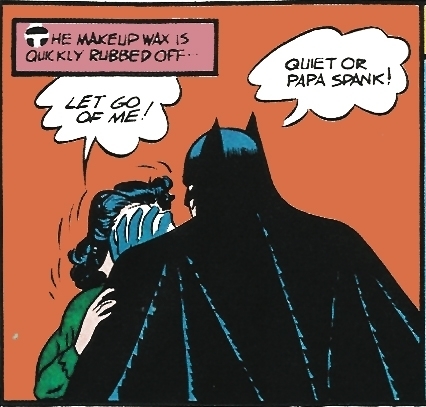 Papa spank!” I love that Paul Dini found a way to reference one of the most notorious Batman lines ever in this script.